Jake Shields only needed two minutes to submit Robbie Lawler in their 2009 Strikeforce meeting. 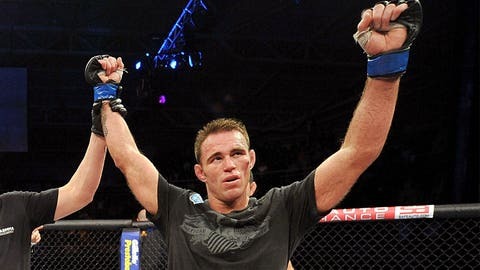 Prior to UFC 167 taking place, top ten welterweight contender Jake Shields had targeted Rory MacDonald as a potential next opponent thinking that beating Georges St-Pierre’s teammate would be the fastest path to another shot at the Canadian champion. As it turns out, MacDonald lost a split decision that night to Robbie Lawler that forced the entire division to shift as the long-time veteran jumped all the way up to No. 3 in the rankings once the dust settled. Today, Lawler and MacDonald swapped positions in the new UFC rankings to No. 4 and No. 3, respectively. The No. 7-ranked Shields is now looking right at Lawler for his next fight for a number of reasons. First, Lawler is ranked above him in the top ten currently, but maybe the bigger factor at play is the fact that Shields has already defeated him. Shields fought Lawler while both were a part of Strikeforce in 2009 in a catchweight bout at 182 pounds. It took Shields just over two minutes to finish Lawler with a guillotine choke, and he’s happy to give the Iowa native a rematch as they are both gunning for the top of the division. I was hoping to fight Rory (MacDonald) and Lawler went and pulled the upset. "Personally, that’s a fight I would love," Shields told FOX Sports on Monday. "I beat him but the fight was so fast it was only a few minutes and I caught him in a choke. I’m sure that’s a loss he would love to avenge and he’s been doing so good. I think we’re both at the top of the division, it’s a fight I would love. "I was hoping to fight Rory (MacDonald) and Lawler went and pulled the upset. I’m like yeah now that makes sense. I’m sure that’s a loss he would like to get off his record. I would love to fight him as well. Robbie’s always a guy I liked and respected, but he’s doing so well, we’re both on big win streaks, it makes sense." Lawler hasn’t commented much since his win over MacDonald a few weeks ago, but given his standing in the division with only Johny Hendricks and Carlos Condit above him in terms of ranking, a chance to avenge a previous loss to Shields could be just the medicine the doctor ordered. Since returning to the UFC, Lawler has been on a blistering run going a perfect 3-0 including two wins over top ten opponents in MacDonald and Josh Koscheck. Shields has been impressed with Lawler’s resurrection in the welterweight division after a 1-3 mark to close out his career with Strikeforce while competing at 185 pounds. He’s had a great resurgence. "He’s looked great. For a minute he was starting to drop off and look slower and I thought maybe he was towards the end of his career, but he’s had a great resurgence. He has three in a row in the UFC, all great performances," Shields said. Shields can’t deny that he’s been impressed with Lawler lately, but that doesn’t mean he’s predicting a different outcome for the rematch if it happens. The only difference this time is maybe the fight will make it past two minutes in the first round. "I think I’ll submit him again," Shields said with conviction. "Obviously you never do know, that’s why you fight. He’s got great punching power, he’s dangerous, he’s coming in better shape, he’s with a new team at American Top Team. He’s looking the best he ever did, but I still think it’s a great match up. I think I’ll go in there and find another submission against him."